I might have crossed a line from "having a few Sansevierias" to "when and where will I buy my next Sansevieria?" Which might mean I'm becoming a "collector of plants in the genus Sansevieria." 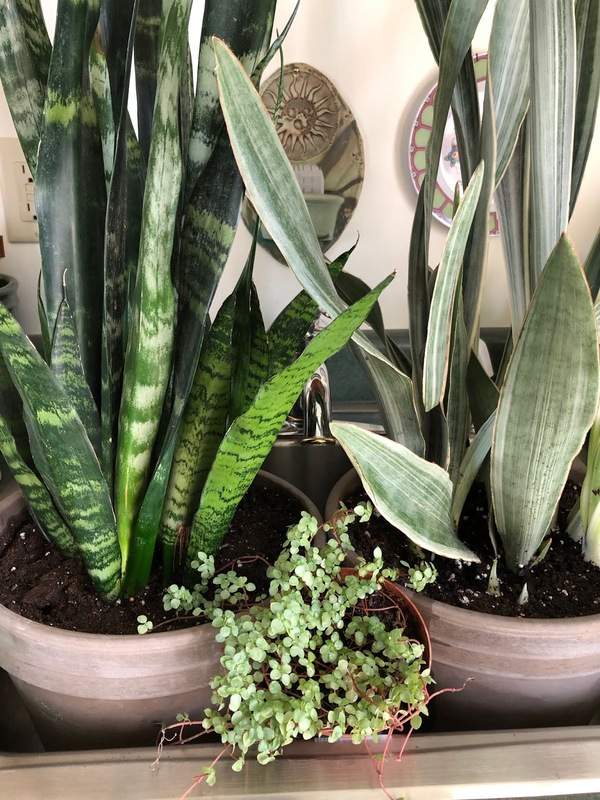 Or maybe I'm just another obsessed gardener who is trapped indoors and now seeks her solace amongst a wide variety of snake plants, or mother-in-law's tongues, or whatever you want to call houseplants of the genus Sansevieria. Oh yes, I, too, once thought there were just two kinds. A tall one and a short one. I now realize that there are all kinds of "snake plants", some of which aren't really "snake plants"; they go by common names like African spears. Sansevieria cylindrica 'Rocket' is one example of an African spear, and I have that one. What we traditionally call snake plants or mother-in-law's tongues are generally Sansevieria trifasciata. I assume my two newest snake plant acquisitions, 'Black Coral' on the left and 'Sayuri' on the right are both this species. But there are also shorter snake plants that are generally referred to as bird's nest snake plants, the most common one being Sansevieria trifasciata 'Hahnii', but you occasionally find them listed as Sansevieria hahnii. I still have to sort out the botanical names before I'll consider myself a collector. I also think I need more than seven varieties of Sansevieria, representing at least two species, which is what I have now before anyone labels me "Sansevieria Collector". - You label your plants so you can keep track of their names. Yes, I'll admit I labeled my snake plants and African spears. However, I haven't crossed the line and put together a spreadsheet listing the ones I have and where I acquired them. I won't cross that line until probably later this week when I have a minute to sit down and collect all the info on the plants I currently have. - You talk to your friends, your gardening friends, about snake plants and begin to hear the stories about the ones they have. How big they are, where they got them, how long they've had them, and in particular, if they've gotten them to bloom. Hearing those stories makes me a little be wistful about the snake plant I once had that I was told was from my great-grandmother's plant. Sniff. I lost it in The Great Mealybug Invasion, which I try to block out of my mind. Someday, maybe my next blog post, I'll write about it. It will be good therapy and provide a warning to others on how to avoid their own personal Great Mealybug Invasion. I feel good after writing all of the above that what I have is not a collection of Sansevieria but just a nice assortment of easy-to-care-for houseplants. I feel relieved. So relieved that I think I'll tempt fate and just do a couple of online searches. "Rare sansevieria" ought to be a good place to start. Yup! Did that with Jade Plant and Lucky Bamboo! Have fun with your new obsession! Ooh! I love Sanseverias. I only have one but it is huge and its one of my favorite houseplants. Where do you buy your more rare varieties? My MIL got me interested in Sansaveria. She gave me one I had for years. One day it up and died. Then I got another that looked like the one she gave me because I felt guilty. This one lives no matter what. I put it on the dryer at Christmas time and forgot about it. No light in that room, no water, no love and it continued to live but was slowly dieing. I felt guilty so I gave in new potting soil and a placed it in a lighted area. It looks much better. I promise I will be good to it from now on. I am so glad to hear I am unlikely to cross that line in plant collecting. I may write things in my little book but it will never be a spreadsheet. I have 4 different kinds of Sansevieria and I think most of them are in the book because they are not on the tip of my tongue, I do remember where everything comes from though. Happy spreadsheeting. I crossed a line a long time ago. When every person who steps foot in your house for the first time says, "You really like houseplants, don't you?" you might have crossed a line. You might really have crossed a line if you one day are the published author of a book about houseplants. But that's only one of my obsessions. Have you heard of the monarch butterfly, by chance? That is one houseplant that I do not like! Your air must be so clean in your house--they are supposed to be in the Top 10 list of plants that purify the air! And I suppose the more rare they are, the more they purify??? Could be a justification for spending on that rare one! Ha. I only have one, so I haven't even got close to crossing that line, but I do enjoy it.